Keep your existing factory electronics in place while adding better sound, smartphone integration, or any other new gadgetry. 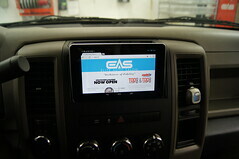 OEM integration allows you to make upgrades in your vehicle without replacing factory components. You can introduce a new sound system without changing your radio, all the while adding an iPod or smartphone source, and still control it with your steering wheel controls. You can add hands-free calling, backup cameras, navigation systems and headrest monitors, and still control them from your existing control unit. There are often features that your factory system accounts for, but doesn’t currently have enabled. We can make the most of what you already have. There are more audio source options now than ever. Your factory radio may give a tuner and a CD player, but you may want to listen to your iPod or stream music from your smartphone. 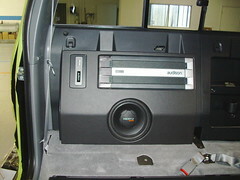 Our OEM integration solutions allow for your factory stereo system to take advantage of these new devices. Bluetooth technology allows for these to be used wirelessly for the ultimate convenience. We can also hardwire these devices so that they have a place in your interior and keep the battery charged while you’re on the go. 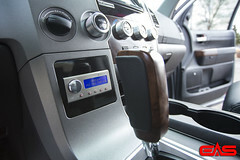 Our digital sound processors allow you to fully upgrade your sound system without changing the radio in your dashboard. These take a clean signal from your head unit and distribute to amps and speakers, leaving the rest of your vehicle’s electronics intact. As an added benefit, the sound processor allow you to tweak how the sound is distributed, allowing you to set a sweet spot in the driver’s seat so that you get a perfect balance of sound. Even if you don’t upgrade your speaker system, you will hear a dramatic difference. Vehicle manufacturers go to great lengths to ensure you have convenient access to controls and information, without forcing you to take your eyes off the road. OEM integration products allow for these accessibility features to stay intact and often with more features than before. You can still use your steering wheel controls to change volume, skip tracks, or even set custom commands on auxiliary buttons. Remote display features can show information about what you are listening to right on your existing factory radio, or even in the gauge cluster on some vehicles. 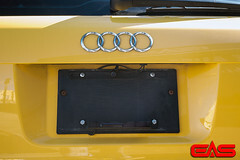 We offer many OEM integration products for specific applications in almost any vehicle. Please contact us for information on pricing and installation. Incorporate an iPod into your factory stereo system with full factory control over your music collection. Stream music over the Internet using your smartphone or play your saved music files over bluetooth. Use your factory stereo system to make and receive phone calls without touching your phone. Use your factory navigation system to display the area behind your vehicle while in reverse. Upgrade your sound system without replacing your factory radio, all with 24bit D/A converters and fully-active digital crossovers for perfect channel separation.